A Ruby-crowned Kinglet perches on a branch in New England. I thought it was going to be the easiest bird photo I’ve ever taken. There was the kinglet, literally right at my feet. It was hopping along the beach a few weeks ago looking for small insects among the plants popping out of the sand. It was a male ruby-crowned kinglet and he was alone at this stage of his migration. I grabbed the camera from the front seat and got out of the car for what I thought would be a quick strike. It wasn’t. The kinglet didn’t fly away and didn’t run away. It just wouldn’t sit still — not even for a second. Now I know how department store children’s photographers feel on their bad days. First, let’s familiarize ourselves with the kinglet. There are two types of kinglet: ruby-crowned kinglet and golden-crowned kinglet. 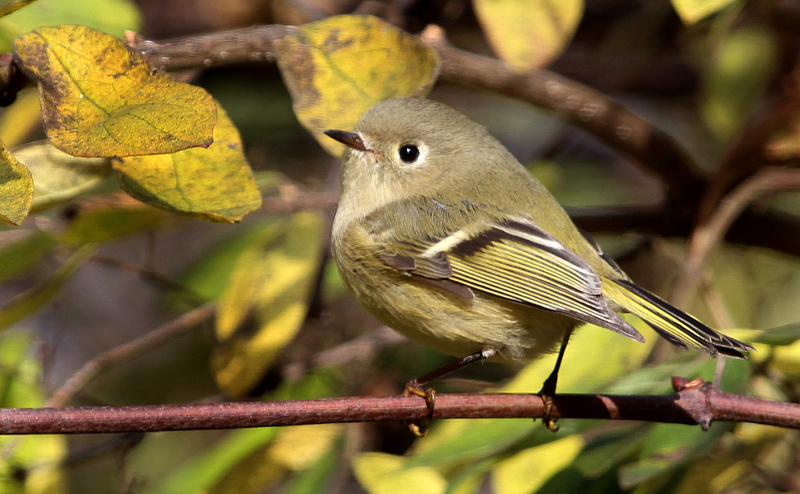 The ruby-crowned kinglet has an eye-ring that doesn’t quite make it all the way around its eye. The golden-crowned kinglet has no eye-ring, but rather an eye stripe. To tell the species apart I like to think of a “ruby ring.” Hey, it works for me. The male ruby-crowned kinglet has a small patch of red on the top of his head, while the female has no patch. With the golden-crowned kinglet, the male has an orangish patch outlined in yellow and the female has a yellow patch. Keep in mind that the colorful patches are not always visible, especially on the ruby-crowned. Usually the species stick together, but I’ll never forget the time I looked out a window of my house and saw a ruby-crowned kinglet and a golden-crowned kinglet cross paths on a hemlock branch. If I ever wanted a side-by-side comparison, that was my chance. The kinglets are also among the smallest birds we see here in New England. The golden-crowned measures about 4 inches, while the ruby-crowned is a whopping 4 ½ inches. By comparison, the black-capped chickadee is about 5 inches (slightly larger than both kinglets) and the ruby-throated hummingbird is almost 4 inches (only slightly smaller than the kinglets). Their tiny size makes it a challenge to photograph them. Even with a powerful lens, it’s tough to fill the frame. But the real challenge is their energy. They don’t sit still. By the time the camera’s auto-focus feature nails the subject, the bird is gone. It’s not far away, perhaps only an inch or two, but far enough to throw off the focus. Now back to my beach-combing ruby-crowned kinglet. I performed the auto-focus dance for a while before switching to manual focus, which proved to be even more frustrating. Usually focusing required only a slight turn of the lens one way or the other, but I always picked the wrong way. By the time I corrected the error — you guessed it — the bird was elsewhere. The bird never went very far and at one point was about a foot away from my shoes. I had already determined before that moment that my presence didn’t bother him. The last thing I’d want to do is deny a hungry migrating bird of a good food source, which it obviously had found at the beach. I wasn’t disturbing him, but he certainly wasn’t cooperating with me either. He was very busy. No time for posing. After several minutes of trying to catch the little guy, I remembered the last time I had tried to photograph kinglets. I was at a Connecticut park and there were kinglets all over the place in the bushes. In a way that experience was even more frustrating because I didn’t know which kinglet to target and, no matter which one I picked, it was constant motion. I never did get a great photo that day, despite there being dozens of little subjects flitting around the bushes. But on this day there was only one subject on which to channel my efforts. The results were not much better. I got a couple of decent photos and a bunch of blurry images of a male ruby-crowned kinglet’s tail. A few photos showed nothing but landscape: sand and weeds, no bird. I missed the little guy by a split second, but it may as well have been an hour. But I can laugh about it now. My therapist says that’s a good thing. He also suggests that I just look at kinglets from now on and not try to photograph them. What does he know? Next time I’ll do better. This entry was posted in For the Birds column and tagged chris bosak's for the birds by Chris Bosak. Bookmark the permalink.